Although 4K monitors are becoming more common, colour accurate models are usually very expensive, making the keenly-priced BenQ SW271 well worth a look. It’s suitable for image editing but a better choice for editing video; in particular high-resolution 4K clips. The new BenQ SW 271 monitor is a more professionally orientated screen than the SW2700PT model we reviewed in October 2017 , although both have roughly the same screen size. Developed to provide 4K resolution for photographers and videographers, like the SW2700PT, it boasts coverage of 99% of the Adobe RGB colour space and includes a B&W setting. Higher resolution and support for HDR (high dynamic range) content make it better suited to video editing than the SW2700PT as well as a better choice for some stills photographers. Many of the desirable features from the SW2700PT carry across to the SW271, among them the IPS screen technology and Adobe RGB colour space coverage, as well as a native brightness level of 350 lux and high contrast for rendering deep blacks. Other shared features include an SD card reader and the Hotkey Puck controller. New in the SW271 is a USB-C port that provides a way to connect the monitor to a laptop or desktop computer with Thunderbolt 3 connections. Fast data transfer speeds make this connection preferable for users who want to edit 4K movie clips. Like the SW2700PT, the SW271supports hardware colour calibration and is compatible with the X-Rite i1 Display Pro, i1 Pro and Pro2 colorimeters as well as Datacolor’s Spyder 4 and 5 models. It also comes with a unit-specific factory calibration report that indicates each screen is individually tested before it leaves the factory. A detachable hood is included in the package. Although 4K monitors are becoming more common, colour accurate models are usually very expensive, making the keenly-priced BenQ SW271 well worth a look. Going on specifications alone, it should provide the necessary colour accuracy and gamut parameters and adjustments for any photographer/videographer who wants to print images and it provides matching resolution when editing 4K video clips. If you’re a stills photographer, whether you actually need true 4K resolution is debatable since the differences between 4K (3840 x 2160 pixels) and the 2560 x 1440 pixels offered by the SW2700PT are only just noticeable when you’re editing images. But it can be advantageous when dealing with high-resolution images and is worthwhile when editing 4K movie clips. If you don’t need 4K resolution the SW2700PT is AU$500 cheaper and will cost a little less to run. 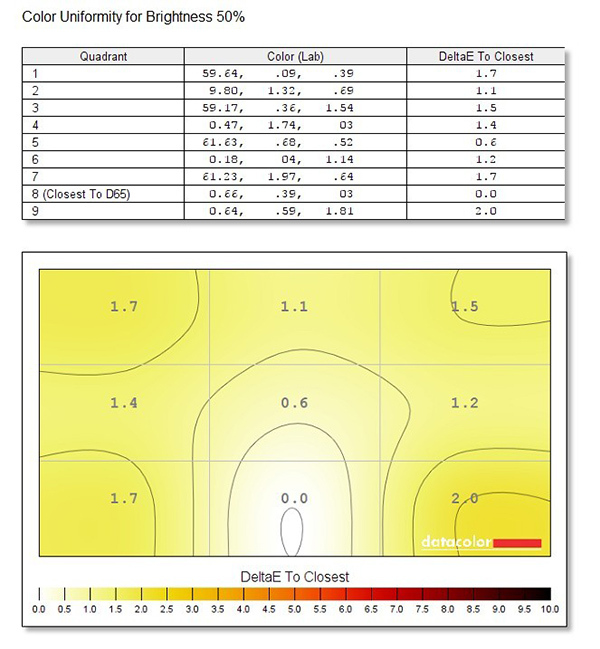 The table below shows the main differences between the SW271 and the SW2700PT. Like the SW2700PT, the SW271 is supplied with everything you need except a calibrator. BenQ’s Palette Master Element software is available free of charge from the product’s support page on BenQ’s website. We recommend downloading the detailed instruction manual at the same time as well as the Palette Master Element user guide. The review unit we received had been used before and came without a printed Quick Start Guide and software CD. Fortunately, we found the monitor was quite easy to configure and connect to a computer, using the supplied cables. The screen and stand are neatly packed in Styrofoam, with the hood in its own cardboard package and all are contained in a large cardboard carton. The stand is connected to the base via a bayonet fitting and then secured with a thumb-screw. It attaches via two locking prongs that slot into a recessed panel on the back of the screen. Cables can be threaded through a circular hole in the stand to keep them tidy. Unlike the SW2700PT, the SW271 has no interface for a DVI cable so we connected it to our computer via the supplied HDMI cable. This interface is required for High Dynamic Range (HDR10) support, which is accessible when the screen is connected to a compatible device displaying 4K content. Although coverage of the Adobe RGB colour space is more important, 4K resolution can be advantageous with images and videos of landscapes and cityscapes particularly when editing files from cameras with HDR stills modes and HDR profiles for shooting video. These settings can encompass dynamic ranges of between 10 and 15 stops, which is beyond the display capabilities of traditional monitors. 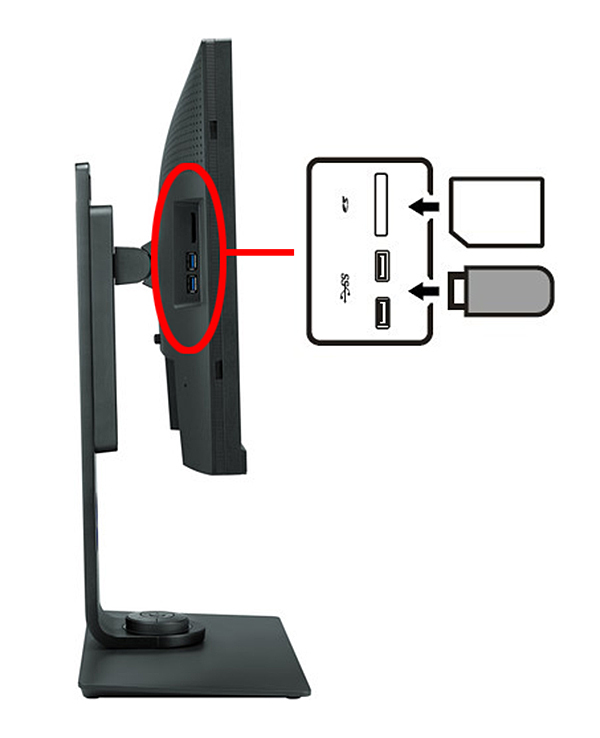 The USB connection is via a standard B plug, which fits into the upstream USB port on the back of the screen. The cable for the supplied Hotkey Puck plugs in next to the HDMI port. Two additional USB downstream ports are located in the left hand side panel, where they sit below a reader slot for SD cards. 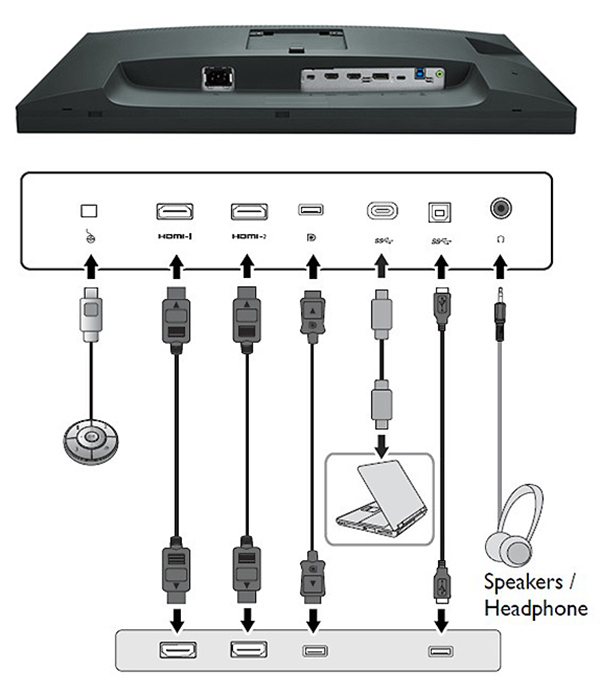 The top USB port is recommended for connecting a calibrator to the monitor, while the lower one will be free to accept USB thumb drives or other media. The screen has an integrated power supply, which connects to the mains via a standard IEC C13 connector, which is supplied. The additional USB ports and reader for SD cards are located around the left hand side of the screen. The Hotkey Puck can be docked in a recessed section of the stand base (shown above). It has four keys for selecting the various display menus and an arrow pad for swapping between menus. Pressing the controller keys will give you direct access to the Adobe RGB, sRGB and B+W screen modes, with the last key exiting the OSD. The hood comes in seven pieces, of which five are used when the monitor is in landscape orientation. The two additional pieces are required to extend the sides when the screen is rotated to portrait orientation. The extensions should be installed before the sides are attached to the screen. It’s easiest to install the hood by connecting the side and top pieces before attaching them to the screen. Once they are fitted, the final piece of the hood sits on top, connecting the left and right sides of the hood. It has a hatch with a sliding cover to allow a calibrator to be passed through. We found this hatch was too small to pass the Spyder5 colorimeter through. Instead we had to lay the USB cable over the top bezel and under the hood’s top piece before positioning the colorimeter on the screen. Once that is done, the pressure of the hood will keep the colorimeter in place. The SW271 has a narrower bezel than the SW2700PT. It’s only 2-3 mm wide at the top and sides and 23 mm wide along the bottom of the screen. 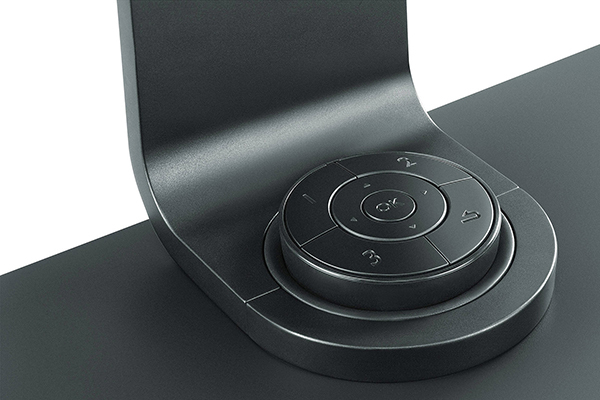 But like the SW2700PT, the screen itself is slim enough to be mounted on a wall using an optional mounting plate. The buttons that control the on-screen display settings have been moved from below the rim of the lower bezel on the SW2700PT to the front of the bezel of the SW271, where they’re much easier to access. The buttons are also a bit larger. The screen is also more adjustable than the SW2700PT, although it retains the ability to be rotated through 90 degrees clockwise into a ‘portrait’ position. However, it can be tilted forward through five degrees or backward through 20 degrees. Horizontal swivelling extends from 45 degrees to the left through to 45 degrees to the right and its height is adjustable through 150 mm. There’s a handle slot at the top of the stand to make the monitor easier to move around plus a vertical scale to help you keep track of height adjustments. No light sensor is provided so you have to adjust the backlight manually via the Colour Adjustment > Brightness setting in the menu. The menus are similar to the SW2700PT‘s with a few notable additions, such as PIP/PBP capabilities (see below) and HDR, DCI-P3 and DICOM colour modes (the latter recommended for medical imaging). Available options will depend on the input sources, functions and settings selected and similar functions are grouped together in four pages. The Display menu, shown above, accesses the Input and Aspect Ratio settings. The Input setting is used to match the video input to the interface cable you are using to connect the monitor to your computer. Four options are available: HDMI-1, HDMI-2, DP and USB-C. The Aspect ratio settings allow aspect ratio settings other than 16:9 to be displayed without distortion. Three options are available: Full (which fills the screen), Aspect (which fills the screen using the input image’s native aspect ratio) and 1:1 (which displays the input image in its native resolution without scaling). The Colour Adjustment menu, shown above, covers a wide range of adjustments. It includes colour mode selections (eight basic settings with three levels for the B&W mode plus three Calibration modes and two Custom modes), brightness, contrast, sharpness, colour temperature, gamma, colour gamut, hue, saturation and black level settings plus two memories for storing custom settings and a reset function that restores factory defaults. The PIP/PBP menu (shown above) is used when configuring images from two independent video sources when they are displayed on the screen simultaneously. The Picture-in-Picture (PIP) mode displays the main video source on the screen while the second source appears in an inset window. The PBP mode provides a side-by-side display of two different video sources. The system menu (shown above) is used to configure settings like the language used (18 languages supported), the length of time menus are displayed and the OSD Lock, which can prevent the monitor settings from being accidentally re-set. Other items in this menu include a re-calibration reminder, USB-C configuration, audio volume and muting and auto power off delay. You can also re-program the keys on the OSD puck and set the screen to rotate the OSD menu automatically when the screen’s orientation is changed. BenQ has co-developed its Palette Master Element calibration software with X-rite and the application supports both X-Rite (iOne) and Datacolor (Spyder) calibrators. 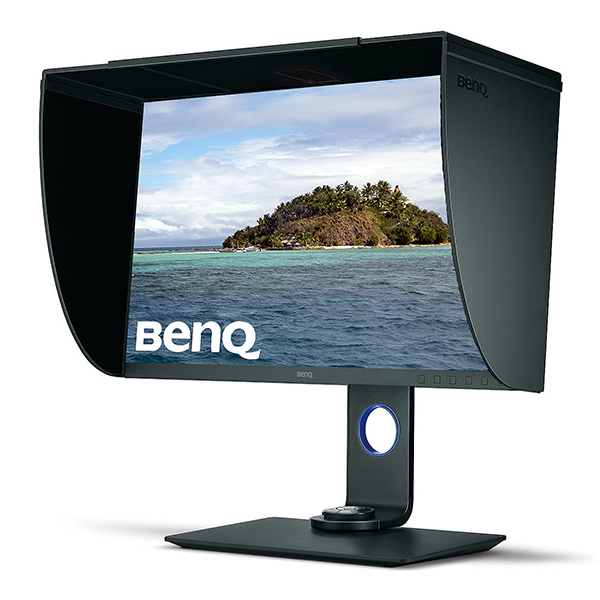 We’ve covered this application in detail in our review of the SW240 (https://www.photoreview.com.au/reviews/peripherals/monitors/benq-sw240-photovue-ips-monitor/). To maintain consistency and ensure valid comparisons with other monitors we have tested, our performance testing was carried out with a Spyder5 Elite colorimeter and software. Because Palette Master Element can interfere with the Datacolor software, we delayed installing it until we’d completed our standard measurements. 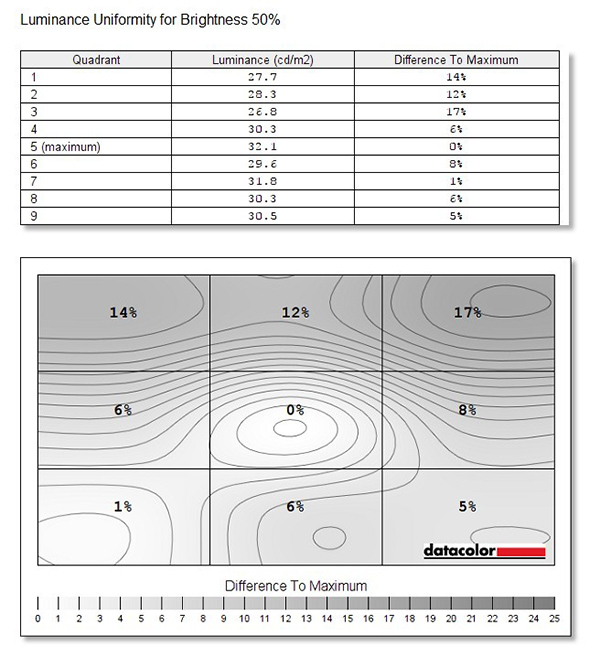 It also lacks some of the measurement functions provided in the Datacolor software. After completing our tests, we ran a calibration with Palette Master Element and found the review screen passed the key criteria. 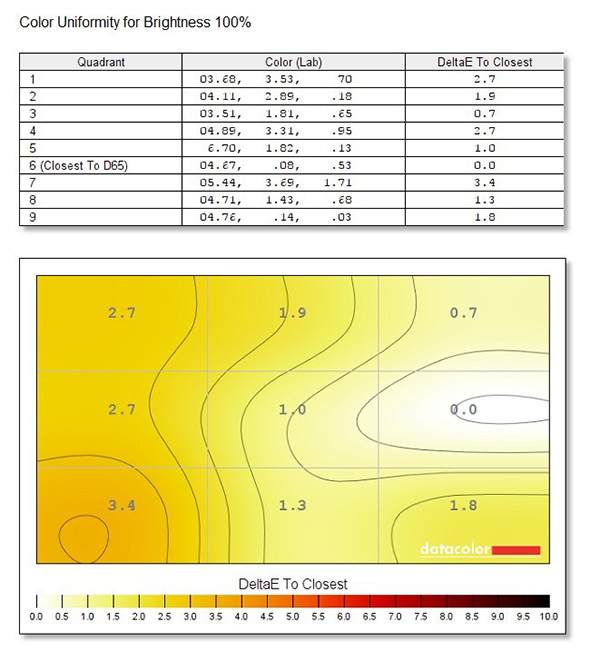 The results were similar to those we obtained when using this software to calibrate the SW240. The review screen looked good straight out of the box, which is in line with the performance you would expect from the supplied factory calibration sheet. Colours appeared natural looking and, once the brightness had been reduced to around 120 cd/m2 (see below), the tonal balance also appeared natural looking and easy to work with. The B&W mode also provided an attractive display with smooth tonality and no trace of unwanted colour biases. Interestingly, switching to the HDR mode appeared to boost both brightness and colour intensity, which is to some degree reflected in our tests. When making the initial calibration with the Spyder5 Elite colorimeter and Datacolor software the screen’s brightness as supplied was much too high. The Spyder software measured it at 253.7 cd/m2 (candelas/square metre) which, although somewhat lower than the specified value, is much higher than the recommended brightness level for image editing, which is around 120 cd/m2. Using the OSD buttons, we reduced the screen brightness to 28% and made subsequent measurements with a brightness setting of 123 cd/m2, which is close enough to the target level. The remaining tests were carried out at that brightness level. As with the SW240, we found the Advanced Analysis showed this monitor’s performance could vary with the different screen modes it supports. Because most photographers will use the Adobe RGB mode, most of the results shown below relate to that mode. However, we also ran tests in the sRGB and HDR modes and have provided graphs for parameters where the results were somewhat different. Like the SW2700PT, the SW271 obtained perfect scores for the gamut and contrast with the Adobe RGB colour space and obtained a 4.5 out of 5 score for tone response. 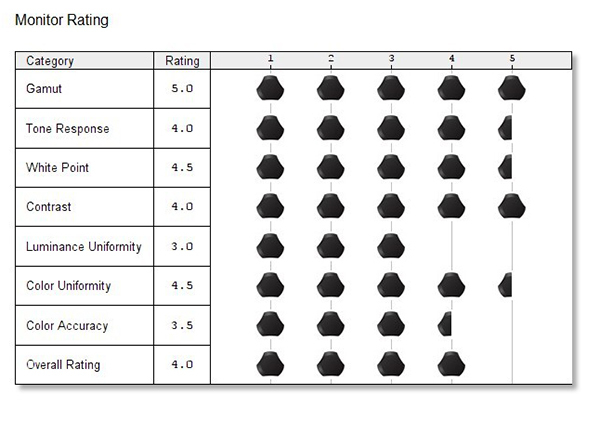 It scored higher for white point and colour uniformity, with 4.5 out of a possible 5. But, it was also let down by below-average results for luminance uniformity and a 3.5 score for colour accuracy, resulting in an overall only rating of 4 out of a possible 5. The overall results represent the sum of individual parameter tests. Individual data graphs and tables are presented below. 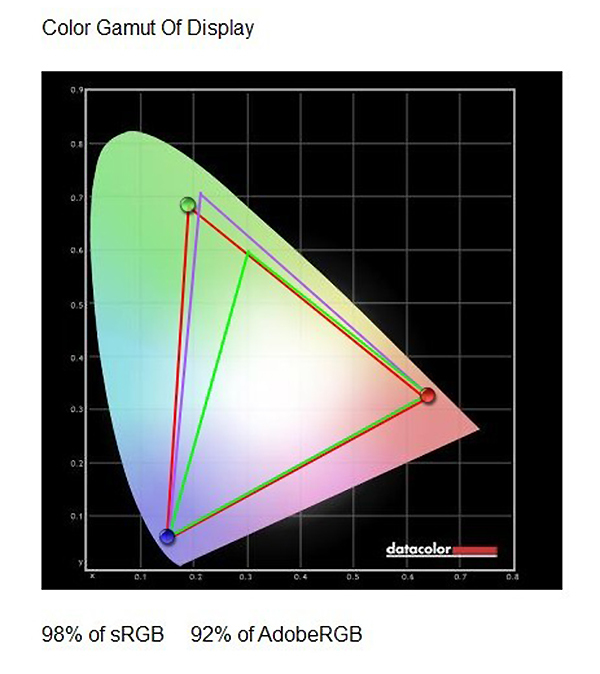 This graphic shows the colour gamut results obtained in the Adobe RGB mode. The green triangle shows the boundaries of the sRGB colour space, while the purple triangle delineates the Adobe RGB colour space. The red triangle shows the measured colour space for the monitor at the designated screen mode. The review monitor managed to cover almost all of the sRGB colour space but was unable to display the full extent of the green band in the spectrum covered by the Adobe RBG colour space. This could limit its use for editing images in which greens predominate, such as some types of landscape photography. 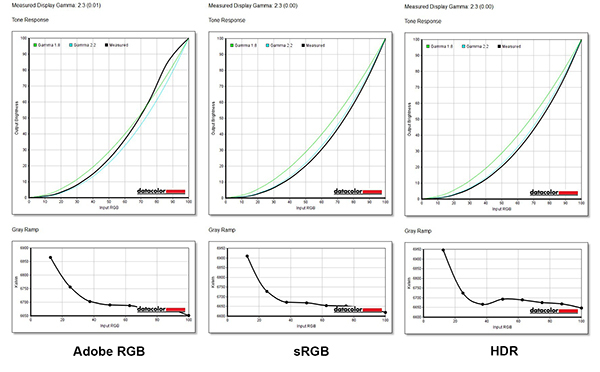 This graphic shows the results from the sRGB and HDR modes, which were effectively identical. In both modes, the sRGB coverage is reduced the most in the green band in the spectrum. We compared the results from the SW271 with those we obtained when testing the EIZO CG2730 monitor we reviewed in September 2017 and found their performance to be very similar with respect to Adobe RGB coverage, as shown in the graphic below. This test measures two parameters: the Tone Response, which shows the Gamma (the relationship between the brightness of a pixel and its numerical value) for the display and the Grey Ramp, which shows how the display performs across the different gradations between black and white. Together, they are a good indicator of how mid-tones will be reproduced. If gamma is set too high, mid-tones appear too dark; if too low, they will be too light. Ideally, the grey ramp should show a smooth transition from left to right. The measured gamma (above) in all three modes we tested was marginally higher than the 2.2 gamma recommended for image editing with Windows PCs. This difference is too small to be problematic. Although the Adobe RGB graph shows some questionable variations at high brightness levels, its grey ramp graph is the smoothest of the three, indicating smooth tonal transitions. This parameter shows one of the weaknesses of the review monitor, which is present regardless of the colour mode selected. 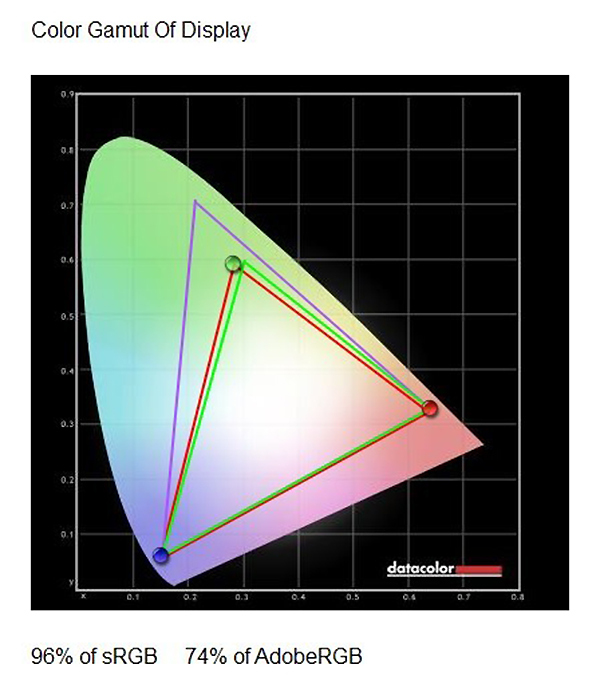 Both the sRGB and HDR modes show significant deviation from the desired hues, particularly in the neutrals. The best performance is in the Adobe RGB colour space, where the average deviation (Delta-E) from the ideal hues is 3.25. Tthe maximum deviation of 4.57 from the average, which is recorded for patch 5E (dark grey) is relatively small and the minimum (for patch 5G) is very close to ideal value. The two Screen Uniformity tests check the brightness and colour consistencies of the display in nine sections of the screen (a 3×3 matrix), at various luminance levels. 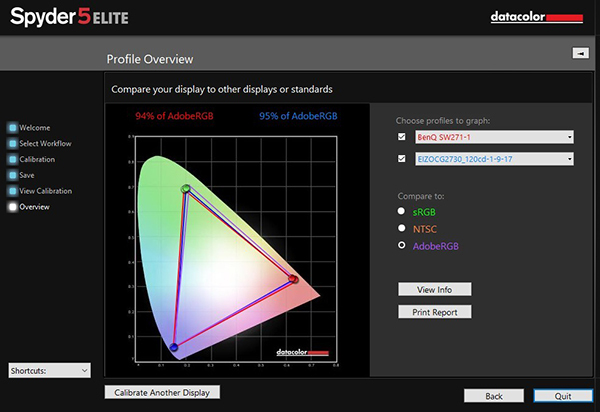 The results we obtained were similar for all three screen modes so we’ve published only the upper and lower graphs for each category, based on the Adobe RGB mode. 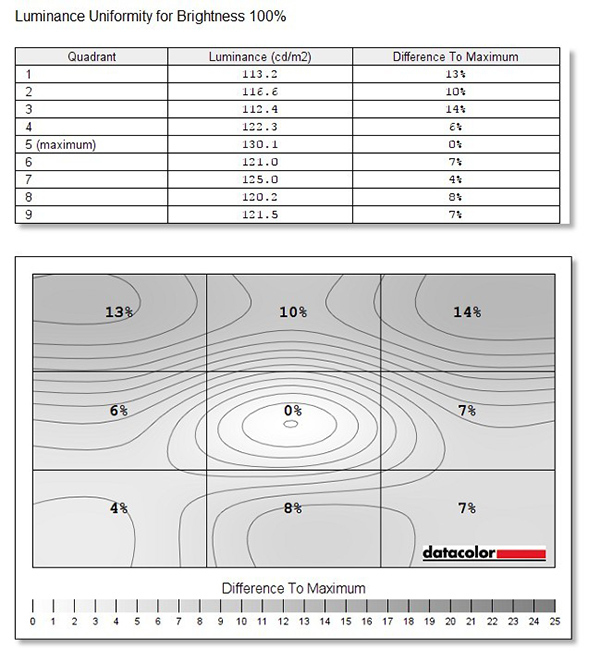 Luminance uniformity plots show a distinct hot spot in the centre of the screen with darker corners in the upper third of the screen at all measured brightness levels. The left corner in the lower third of the screen is also brighter than its neighbours. Altogether, these readings account for the relatively low score for this parameter. The colour uniformity plots show a similar hot spot, which varies in position with the brightness of the screen. At the maximum brightness, the hot spot is in the bottom right corner, while at the minimum brightness, it is on the right hand side of the centre band. These results are not ideal but should present few problems when the screen is used for image and video editing. Overall, we’d regard this monitor as being suitable for image editing but a better choice for editing video; in particular high-resolution 4K clips. It’s price makes it very competitive in this area and plays a role in our favourable overall assessment of the screen. 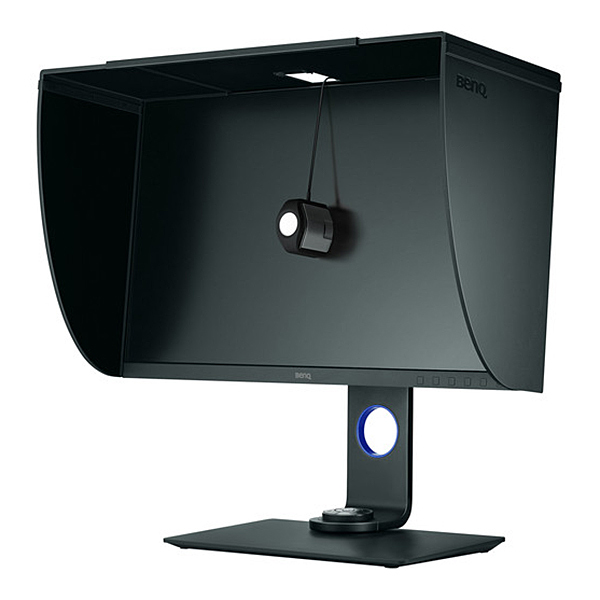 While, the BenQ SW271 doesn’t quite match the Eizo monitors we’ve tested in all parameters, it’s roughly half the price of the Eizo CG2730, which has the same screen sizes but slightly lower resolution. 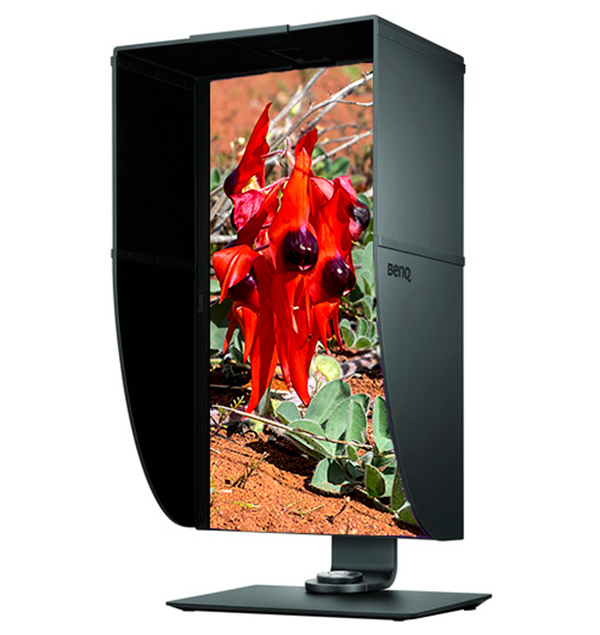 Eizo’s entry-level monitor, the CS2730 is also more expensive than the SW271. If you’re on a tight budget and prepared to accommodate the screen’s slight deficiencies, performance-wise the SW2700PT is available for less than AU$1000, but offers the same 2560 x 1440-pixel resolution as the two Eizo screens. With both the BenQ monitors, we’d suggest you stick with the Adobe RGB screen mode to ensure the best available colour accuracy. The monitor is easy to assemble and isn’t too large for a two-screen set-up and it integrates well with Eizo screens in dual-screen configurations. The controls are well set up and easy to access and fine-tune and the adjustments are wide enough to cover most potential users’ requirements. After initial calibration, during which the screen brightness was substantially reduced, we found the review screen bright and easy to view and its colour balance appeared to be quite natural looking. We also found we could use the screen all day without experiencing any eye strain. You can plug the SW271 into computers running the current ‘flavours’ of Windows and Mac operating systems and its fast response times and negligible input lag make it very well suited for video editing. There’s nothing to complain about when it comes to build quality and ease of use and the shading hood is a welcome bonus. All these factors make the SW271 a good choice for anyone who wants to edit 4K video clips and/or create high-resolution animations. Because it’s a recent release and only a few outlets are selling it, you can’t expect bargains to be offered just yet; all the prices listed were AU$1599, the same as the RRP. Be careful when shopping to include any associated delivery costs. High shipping costs and the risk of damage in transit make it uneconomical (and unwise) to buy this monitor from an off-shore re-seller. BenQ supports its monitors with a three-year warranty that applies from the product’s purchase date. Details are available from the product page on the company’s website. Buyers of this monitor are also entitled to all the protections available under Australian Consumer Law.